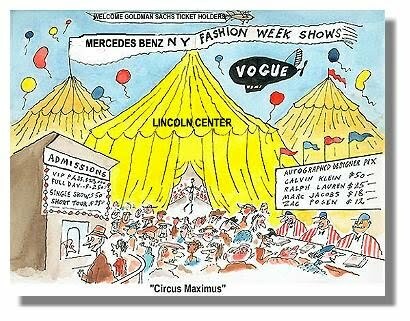 Editorial: Fashion Shows "Pay to Play"
After the very public fashion show held Tuesday night at Lincoln Center where tickets were being sold upwards of several hundred dollars each, I think we are going to see more shows being offered up to the public for a price. Years ago, designers used to have two shows each season, one for the press and the other for the buyers. It changed because Bernadine Morris, then the senior fashion writer of The New York Times used to go to the buyers' show instead of the press show. Designers soon began showing only one show, with one side of the runway for press, and the other side for buyers. In the future, designers may leverage their brand more and more by making use of a "public show" allowing those who can afford the ticket price access to it. I think they will then have a second small "exclusive" private show for select top press, celebs and buyers. Other minor press, bloggers and "lesser lights" will be given the opportunity of accessing the collection for free at the public show. Some of the designers are already leveraging their brands at the low end of the market by selling collections to H&M and Target, so opening the shows to the public is a good way to help pay for the show and market their collections to an eager and willing public.